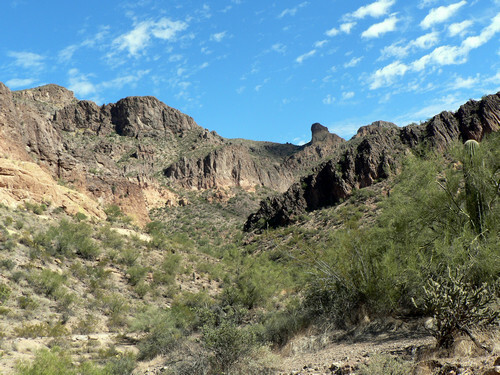 These canyons cut through the Goldfield Mountains north of Apache Junction, then drain into Saguaro Lake and the Salt River. They are close to town, so are good for a short trip. 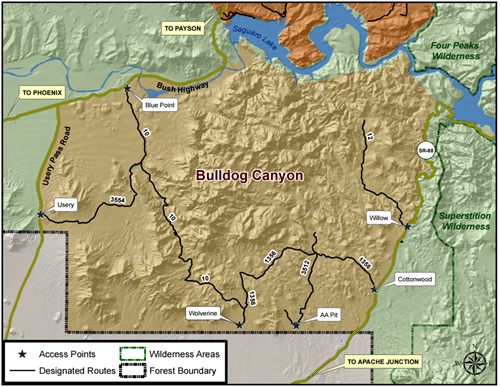 This road system is part of the Bulldog Canyon Off-Highway Vehicle (OHV) area administered by the US Forest Service. A free permit is required for vehicle access through locked gates. 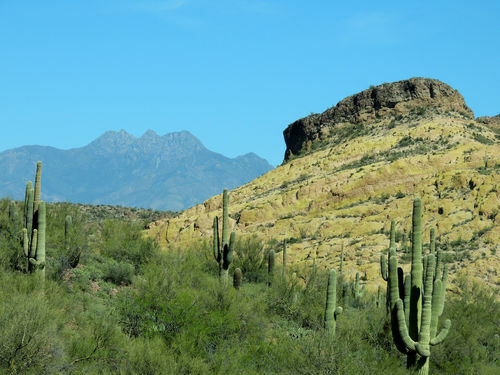 Get permit from the USFS office at 5140 E. Ingram St, Mesa (just south of McKellips and Higley), or get it online. 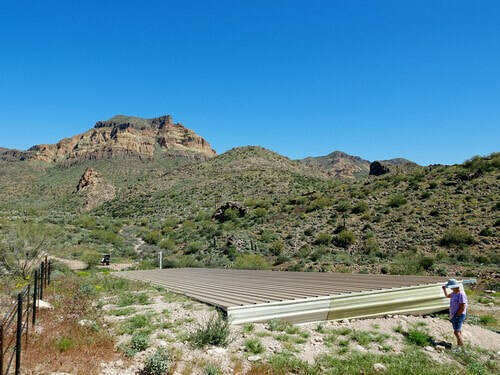 Gates are in place to reduce illegal dumping. Please close and lock gates behind you to support this effort. Continued dumping may bring closure of the area to motor vehicles. 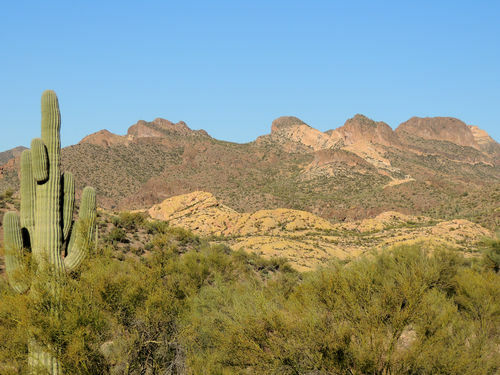 View permit and map online before applying. 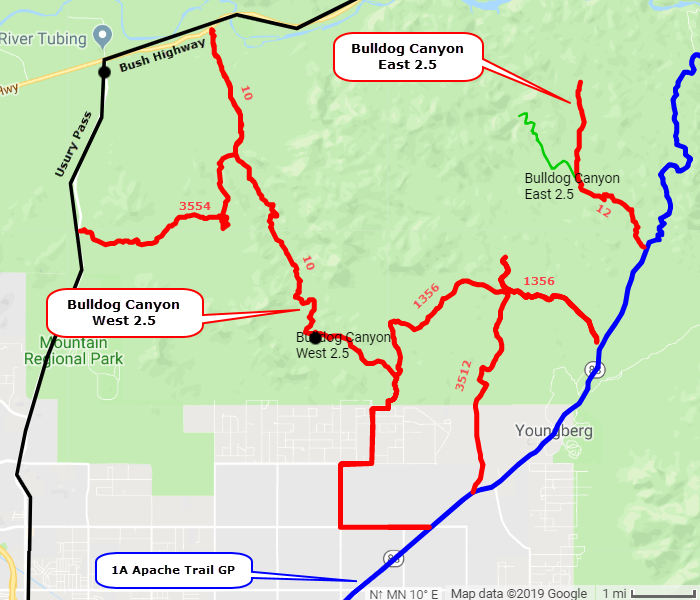 There are 2 separate sections in the OHV area, and a gpx track for each area (Bulldog Canyon West 2.0 and Bulldog Canyon East 2.5 (Willow Springs). 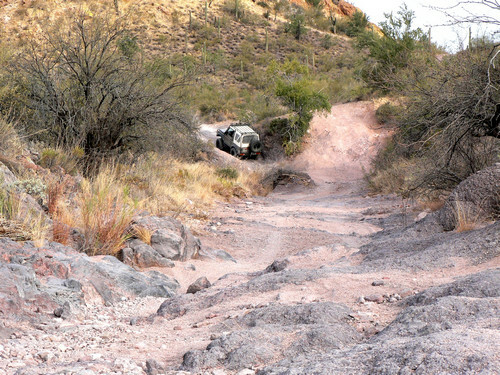 Bulldog Canyon West Jeep trails are mostly 2.0, but there are a few areas that approach 2.5 so that is how it is rated. Not a difficult 2.5. Scenery is beautiful. 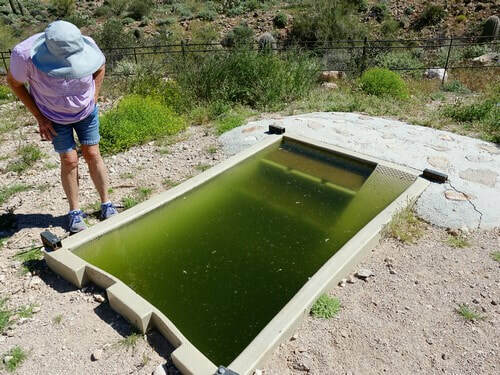 A guzzler collects rainwater, stores it in an underground cistern then dispenses it for wildlife to drink. 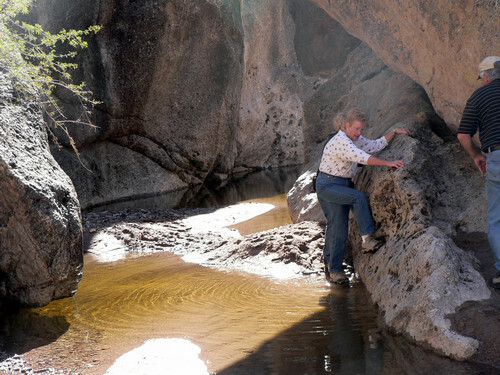 Note the steps and ramp for low water levels. 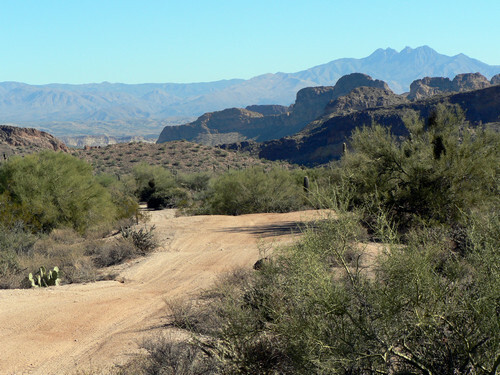 Bulldog Canyon East now has a single road that is fairly mundane. 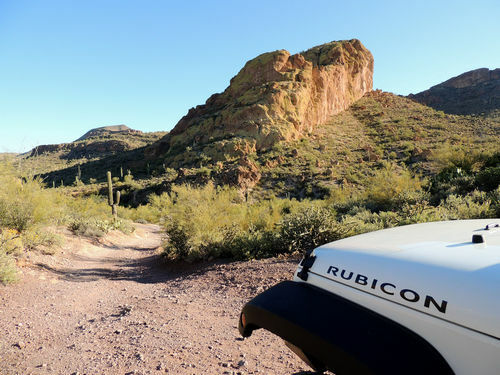 In the past you could drive a very scenic 1.9 mile road down Willow Springs Canyon west of Road 12 , then hike 2.3 miles down a deep, narrow canyon to Saguaro Lake. 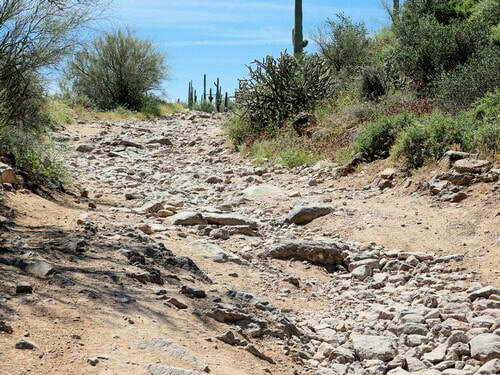 The Forest Service, in their infinite wisdom, closed the road west of Road 12. 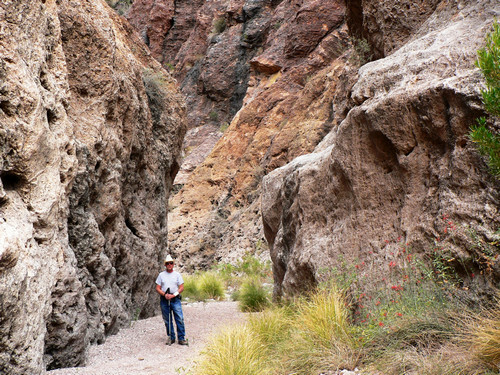 Still would be a nice hike, but longer. 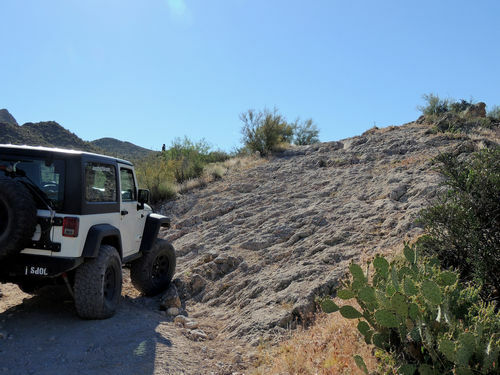 The remaining legal road has a few small boulders and ledges, as well as a bit of scenery. Rated 2.5.